Having recently returned from a research project it Italy, I was curious to have the chance to evaluate a set of wines made from the Montepulciano grape as well as gauge the reaction to these wines from a group of people who are totally unfamiliar, for the most part, with anything different from their everyday sorts of wines. Would a crowd of Cabernet & Chardonnay drinkers find these wines of interest? The line-up features wines made exclusively of Montepulciano, with one exception, a wine blended with 30% Sangiovese. Half the wines are from the Abruzzo region, where "Montepulciano d'Abruzzo" is the red wine of the region. The other half hail from the region called Marche, a relatively obscure wine area to most West Coast wine drinkers. As with many Italian wines, there's always a fair bit of confusion. The name "Montepulciano" refers to a grape in this instance, but many people are confused because there's another wine with Montepulciano in the name. That would be the Tuscan red called "Vino Nobile di Montepulciano." But Vino Nobile comes from a town called Montepulciano, while the grape is a Sangiovese called Prugnolo Gentile. The Montepulciano grape is found in numerous regions around Southern Italy. Abruzzo, of course, is a prominent place for Montepulciano. The grape also plays a prominent role in the Marche where two major appellations are the Rosso Conero and Rosso Piceno. The former is, at least 85% Montepulciano, though many are 100% varietal. The latter is about 50-70% Montepulciano, augmented with Sangiovese (usually). 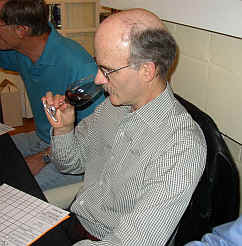 The tasters commented on how much some of the wines developed in the glass over the course of the tasting. We had a range of wines, from relatively normally-priced to those asking a premium for the privilege of acquiring a bottle. I liked the nose of this wine quite a bit, but it promised far more than the wine delivers on the palate. The fragrances show notes of dark fruit and just a whiff of wood. 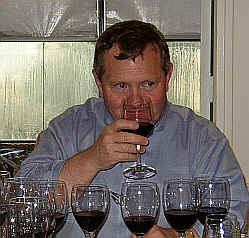 On the palate the wine is leaner than anything else in this tasting, being perfectly pleasant, but simply shallow. Not flawed, just standard quality. 7th Place: DEZI 2000 MARCHE ROSSO "Dezio"
Our two modestly-priced entries brought up the rear, sadly. 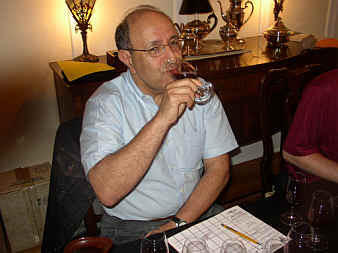 Dezi's 2000 Dezio shows aromas of red fruits and berry which are quite attractive. For all the charm on the nose, the wine is a bit tannic, coarse and astringent on the palate. The tannins are mouth-drying, though there is a nice bit of dark fruit flavor here. I gave it a one star rating on my three star scale, no stars being standard or ordinary. 6th Place: ANTONIO & ELIO MONTI 2000 MONTEPULCIANO D'ABRUZZO "Pignotta"
Here's another wine that's redolent of black fruit aromas with a ripe quality. It's rather full-bodied and deep on the palate. I found it to be slightly jammy, but pretty good. It has five to eight years' worth of tannin. One star. 5th Place: CATALDI MADONNA 1999 MONTEPULCIANO d'ABRUZZO "Toni"
I was bothered by an odd aroma reminiscent of candied orange peels and I also detected a somewhat "meaty" element on the nose. But even with those qualities, I still found this to be a good wine, showing a note of cocoa on the nose. It's a robust, hefty red wine with a fair bit of tannin, but a nice bit of stuffing, too. The wine needs rich food to counter the tannins, which suggest five to ten years of cellaring. One star. 4th Place: LANARI 2000 ROSSO CONERO "Fibbio"
Though it displays a bit of berry-like fruit, my initial sniff of this showed a mild note of resin which I don't care for. The fruit, though, is big and ripe. 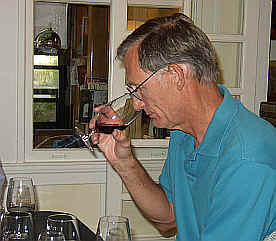 The wine showed a bit of heat from the alcohol and, combined with substantial tannins, is a bit harsh at this stage. It's got a fair bit of fruit on the palate, so I'm willing to give it a one star rating. This was a really stellar wine on my scorecard! I found the nose to keep blossoming over the course of the tasting, with plenty of sweet oak and sweet, dark fruit notes. On the palate the sweetness of the wood really balances the deep, dark fruit and mild tannins. It is big, rich, yet not too astringent nor too ripe in fruit. I'm giving this a two-and-a-half star rating...very fine!!! 2nd Place: IL FEUDUCCIO 1999 MONTEPULCIANO d'ABRUZZO "Ursonia"
I liked the dark berry qualities in this big, woodsy red wine. I am not familiar with Il Feuduccio's wines, but would like to taste another sample of this, as our bottle may have been slightly tainted by the cork. I found a woodsy, cellar-like fragrance on the nose and detected a whiff of that on the palate. Even so, the wine showed positively, with a nice toasty quality from the oak. It's got five to eight years' worth of tannin. Young, impressive and worth trying again. I still gave it a one-and-a-half star rating. 1st Place: LE CANIETTE 2000 ROSSO PICENO "Nero di Vite"
Our group's top wine, nine of the eleven tasters having ranked this first or second. Two tasters, ranking it last and sixth, accounted for more than half its total points!!! Deep in fruit, there's a nice cedar and vanilla note on the nose here with a touch of peppermint. On the palate there's a tar-like quality with a mild jammy note. It is, in some respects, a classically Italian red wine. One-and-a-half stars.